Liberal allowed five second half points on their way to a 37-22 victory over the Buhler Lady Crusaders in the first round of the Salina invitational tournament at Salina South high school on Thursday afternoon. Liberal overcame first half struggles with offense, rebounding, and foul calls. A Buhler team which starts four freshmen led 11-9 after one and 17-13 at the break. Buhler did not score a second half field goal until the 1:18 mark of the third quarter. Liberal took a 24-18 lead after a steal and subsequent Ali Lucero three pointer. The Lady Red led 27-22 after three. 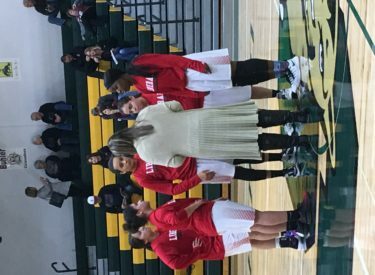 Machia Mullens scored 10 and Lucero added eight. It’s Liberal’s first mid season tournament opening won’t since a 49-40 win over McCook in Colby in 2014. Buhler defeated Liberal to win the 1987 state title but the current Lady Crusader team is 2-8. LHS is 9-1 and plays Abilene or Salina South Friday at 3 in the Salina Bicentennial Center on 1270 and kscbnews.net with Redskin Pregame at 2:45.